This blog is split into two parts - one which I wrote before the Perseids display of August 2017, and one after, showing what I managed to capture. 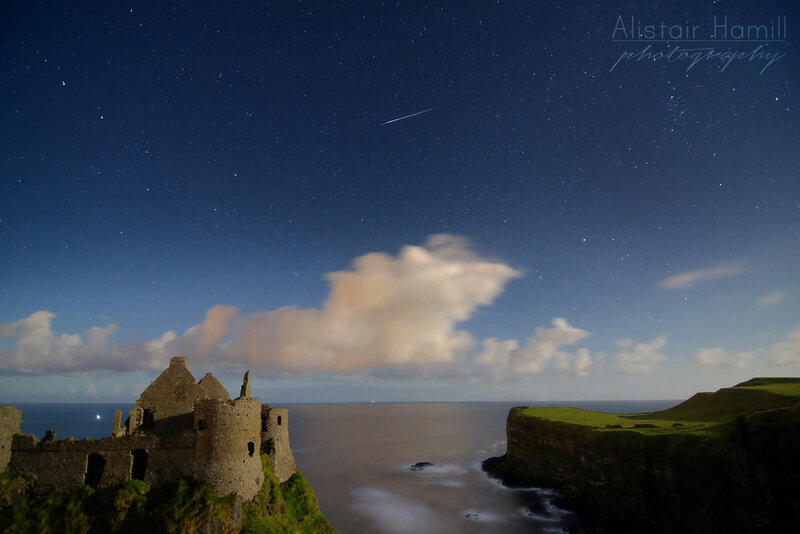 Tonight is the peak of the annual Perseids meteor shower, and with clearish skies forecast for Northern Ireland tonight, we might just have our best chance in a few years of viewing them! This meteor shower is the result of the Earth passing through cosmic dust left behind by comet Swift-Tuttle. As we pass through this debris stream, the tiny particles of dust burn up as they enter our atmosphere, travelling at nearly 60 km/second! As we are moving in to this debris stream, they come at us quite quickly and, at the peak, we could be expecting perhaps one or two per minute. But, they don't come at a regular intervals, so keep youe eyes peeled - you don't want to blink and miss one! They radiate from the area around Perseus constellation, which is rising in the North East this evening, but they can appear at any point in the sky. The best way to see them is to find somewhere away from light pollution, get a blanket and lie back and stare up at the sky. The fainter ones will be fast. But if you're really lucky, you'll get to glimpse a fireball, a particularly bright and longer lasting meteor. They are pretty amazing to see. Wrap up warm, bring some snacks, and lie back and enjoy the show! A fireball tracks across the sky whilst I am standing still for a 30 second exposure, whilst the Mother's Day aurora of 2016 dances in the sky above! If you want to try to photograph the meteor shower, here are some tips. Use a camera with some form of manual control which allows you to set a longer shutter speed. Place it on a tripod. Focus - focus on a distant bright light or the moon, and set your camera to manual focus to keep that focus locked in. Aperture - set this as wide as you can on your lens (lowest f number) to let as much light in as possible. ISO - set this quite high. Start around ISO 2000. Shutter speed - keep this between 5 to 10 seconds to try to capture some of the fainter meteors. Do a test shot and check your histogram. If the exposure is too dark, increase ISO; too bright in the sky, pull the ISO back a bit. Use an intervelometer to take lots of photos! By the time you see most meteors, they''ll have gone before you can press the shutter. The best way to try to catch them is to let your camera shoot away and to check later when you get home what you have caught! Don't forget to turn off the in-camera noise reduction. This will cause a delay between each expsoure. And, of course, while you're waiting, that's when the big fireball will track across the sky! Charge your batteries well, and have a clear SD card for all the photos you'll take! The one challenge we'll have tonight is the bright Moon. It will wash out the fainter meteors, and it might cause the sky to be very bright. Experiment with your settings when you first arrive to balance the exposure with whatever light there is from the Moon. And you're probably best to point away from the Moon towards the darker portions of the sky. This test shot from earlier this week shows just how bright the sky can be with the Moon shining. I've included the camera settings and histogram for this shot to show you how I set my camera. In fact, I think this sky is a bit too bright! Watch out for that tonight. And so, it turned out that the skies did clear quite nicely, allowing for the best viewing conditions I've had since I started chasing after the annual Perseids display! I started at Dunluce where I shot a timelapse. As I mentioned above, I simply set the camera to shoot by itself for an hour and a half whilst I lay on blanket, with a pillow, gazing up at the skies above. Some clouds were passing over, but the sky was pretty clear, and the clarity was amazing. Before the Moon rose, the sky was still dark enough to get great views by eye of the Milky Way. And the clear skies and our vantage point allowed us to zoom a few dozen meteors, including two fireballs strong enough to leave an ionised vapour trail behind them. You have to deciude to point the camera in one particular direction, of course; and it's only by chance if you manage to catch any of the fireballs in that direction. During the hour and a half, I appear to have captured the princely sum of - one fireball! Still, one is better than none, and it was above the castle, so I called that a result. Close up of the main meteor I was able to capture. This one streaked across the sky, leaving behind a trail that fizzled in the atmospherte for a few seconds. Note the green tinge on the end of the meteor trail. After I had finished the timelapse, the sky had cleared even more, so I decided to head for the Causeway. I had a shot in mind that involved the vertical columns (which I knew would be lit by the Moon) with the Milkty Way in behind it - and we me on top of the columns too! Using the intervalometer technique I've used before (and explained here), I grabbed some shots. But it was only when I got back to the computer that I realised I'd managed to capture a Perseids going throught the Milky Way in one of the shots. I was delighted. But even more so when I zoomed in to that shot to discover not just one but two other fainter meteors in the same shot! Once I was done here, I went back down to Dunluce to capture one more shot. By now it was 3.00 am and I had one final location I wanted to visit - down by the shore, looking back up at the castle! I love being down here at the best of times - but especially at night, when the dark cliffs close in all around, sucking in the light, and the castle stands proud above silhouetted on the headland. By this time, the moon had risen high enough in the sky to light the castle and to pick it out. I was tired, but very happy after a great night's astro photography. And the best Perseids chase I've had since I first started doing it 5 years ago.